Here is a quick and easy way to add a little charm to your gift packages. 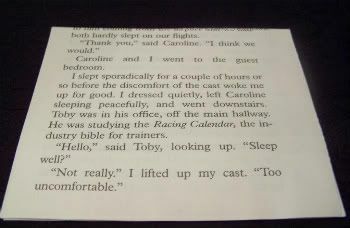 I know a lot of bloggers have extra book pages from all the fabulous paper projects floating around. Here is a way to use some of those scraps so that nothing goes to waste! 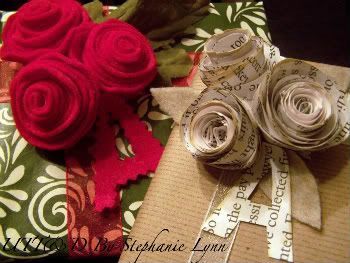 You can also make these with scrapbook paper, cardstock, fabric and of course felt as shown above. You want to start with a square shape. I used three sheets together to add a little volume. None of this has to be perfect…I promise…they will have character and charm even if you eyeball it! 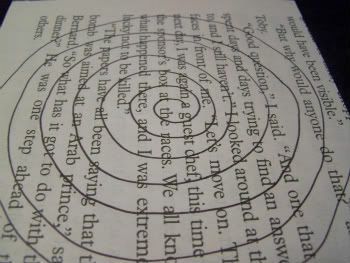 Using a pencil or a light colored pen or crayon, you want to draw a spiral circle onto the square. I used a black marker just so that it would show up in the picture. Next you want to cut out all the lines that you have drawn continuing until you come to the center of the spiral leaving a small circle at the end. You’ll be left with a long paper snake! 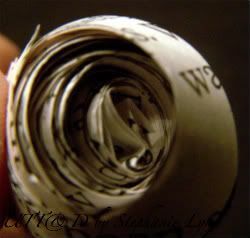 Starting with the outside of the spiral roll the paper inward in somewhat of a cone shape. You want to start off rolling tightly (which will become the center of your flower) then loosely once to get to the edges. Keep rolling until you get to the end. You will want to put a dab of hot glue on the back to hold the shape. 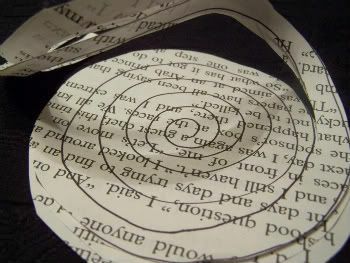 The circle that you left when cutting the spiral will finish the back. 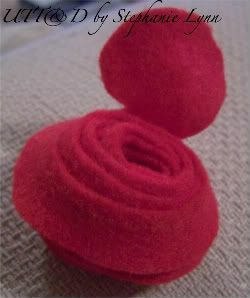 I cut it off on this paper flower to show you the roll; however you can see the circle in tact below with the felt. I gently rubbed some Tim Holtz Distressed Ink (Antique Linen) on the edges of each flower for a worn look. I simply attached them to the packages with a dab of hot glue and added some ribbon and hand cut felt leaves. For the tag I cut out an initial from a scrap page. I followed the same process for the felt. It just happens to photograph better so here are some more pics! Here is the end with the circle I was talking about. I filled the inner part of the flower with hot glue and folded over the circle for a finished look. This also helps to hold the flower together. I love using scraps to decorate my packages. It is always a challenge to see what you can come up with! Happy wrapping! Enjoy! These flowers are wonderful! Thanks for the instructions. I am definitely going to make some of these. They are beautiful – love it. Thanks for sharing. Amazing! Thanks for the tut. I have been looking for something relatively no sew to adorn some stockings. I have felt and hot glue! Absolutely beautiful! I love this idea and will be putting it into action as soon as I can! I love the felt flowers. Very cute. i love it! i am going to try to make one! i hope they turn out as beautiful as yours! good luck to me! thanks for sharing! 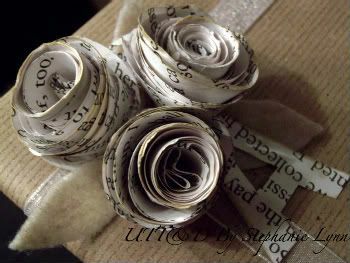 I love these flowers and also love using pages from old books. It’s really elegant. Thanks! Oh my! THese are so pretty — I’ll be giving this a try! Those are so pretty! I love the recycling idea. These are very special! So delicate and pretty! I’ve posted a link on childmade.com. Thanks for sharing! I love those! Your site is great! Most excellent craft with beautiful results! I will definitely be doing this one and soon. Thanks for the great pics/instructions. Love it! 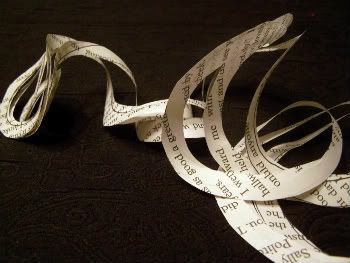 I’m hooked on fun things to do with old book pages, so I’d love to try this. I LOVE these. Crafting with paper is my current preoccupation — so thanks for the inspiration! I HAVE been making fabric flowers lately as little thank you gifts but I LOVE the paper idea…Goodness KNOWS I have enough paper! PLUS I adore paper crafts! THANKS SO MUCH!!!! this is gorgeous! I can’t believe how simple they look. I’ll definately be making using the tons and tons of scrapbook paper I have. thanks for sharing! You are so creative. I LOVE these flowers, especially the book page flowers. Thanks for sharing! True friendship is like a rose: we don’t realize its beauty until it fades. Flowers gives the way for the true expression of your feelings. This website is providing very good flower ideas and offerings. Send Gifts to Pakistan Like flower, cakes, chocolates etc through. This article provide a great information about flower gifts. Flowers are a great sample of showing your love to others. Its a great idea for any Occasion. Send gift to Pakistan like, Flowers, cakes, toys, chocolate etc. Absolutely amazing. 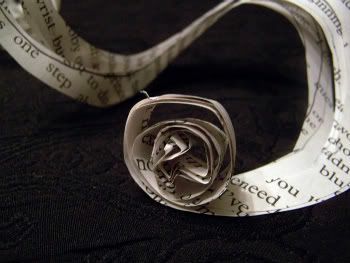 I love making rosettes out of old paper, but never thought of doing flowers this way! I can’t wait to try it! I always love another medium to use for flower making! Thanks for this one! My wife uses to do crafts every time she can so I am pretty sure that she will love to take a look to this very creative blog. I love these flowers -I can’t wait to try this! Your blog is lovely! LOVE LOVE LOVE IT! Maybe I can make a wreathe out of these cute little flowers! Goodness knows I have too many books! Very Nice Idea. These flowers are beautiful I would try to make for my friends. Thanks for sharing. SO CUTE! I posted a little blog about this, just wanted to let you know. merci J’Ai découvert grâce Votre blog magnifique une miette (France ) Verser CE tuto JE Pense Bientôt l’ essayer. I saw these on your blog along time ago, but we’re just now making them; I thought I would let yu know. My children are delighted with them! I’m really excited to try some of these flowers. Thanks for the easy to follow tutorial! I absolutely love these flowers and the inspiration it gives me is so exciting! 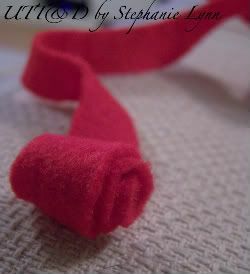 I would love to feature this tutorial on my crafty website if I may have your permission! Love this! It’s a very good post. It will definitely increase everyone’s knowledge. This sort of information should be posted so that everyone can take advantage from these. So, keep sharing these posts. This flowers are really beautiful. I’m goingo to do it for my family’s and friends’s presents for Christmas. These are gorgeous! Can’t wait to make some. I love this too! Great blog! Thanks for the inspiration! Wow! So perfect! I am glad I found this BEFORE the holidays were over! Thanks so much! Lovely flowers and looks so easy! Will have to try this! Love wrapping packages and always looking for new ways to trim them out! BTW, found my way here by way of facebook and Barn Owl Primitives! Just thought you might like to know. I know that this is a really old post, but I just found your site. This is such a great idea!! Thanks! So much fun! Thanks for sharing. When I make mine and post it on my blog, may I refer them to your page? I’m totes going to use this for my wedding coming up! I’m 18 and I just had two kids- that’ll be a good surprise for their dad. Thank you so much for this tutorial. These flowers are gorgeous. You have inspired me to have a go tonight! 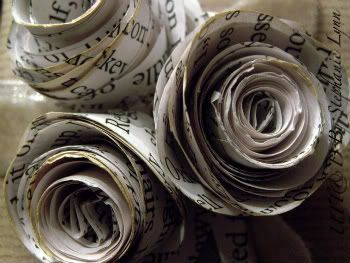 hi love you’re roses out of newspaper, but Iam not a very good drawer is there a tablet i could use to trace the spiral circle? Newest follower, I know you have a lot but it’s never too late to have more friends! Found you on blogtopsites! Thank you for the instructions on your great flowers, I would love to do them. I know you are busy, but hopefully you can stop by for a visit. These ideas can save Flowers and roses. Thank you for improving my package decor enhancements!!! Beautiful flowers!! 🙂 I love the ones made from print. Wow. Very creative, and they look awesome! which person do you like to send your production as a gifts? Gifts are something which everyone always like, but such kinda gifts with effort to put in is something we can call it special gifts. I attempted making these from small paper lace doylies along with muffin cups and they look cute – for a first time anyway! Would love to share my picture attempt. I’m not on Facebook, so maybe i’ll email it through to you. Well, the flowers and plants definitely make the life, relationships and the surroundings better. It says, there’s magic in flowers that brings a smile on a face. Thanks for posting this useful article. It was really helpful for me. I gained a lot of information reading your post. Many thanks for this wonderful post. Best of luck!!! Thank you for sharing! Love the idea! 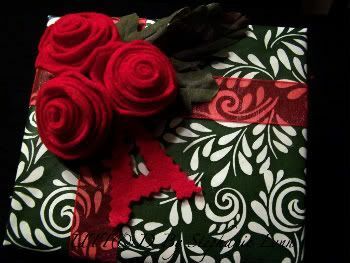 Your gift topper roses look adorable and the felt ones would make beautiful brooches. Thanks for this lovely full step by step.